Risk Rating: The Digest’s 2019 Multi-Slide ABLC Guide to Ecostrat : Biofuels Digest | Alternative Energy news. We provide you with the latest breaking news and videos straight from the Alternative Energy industry. Ecostrat has over 20 years experience sourcing and supplying over 5 million tons of wood fiber and organic feedstock in markets across North America. They offer biomass feedstock supply and analytics to understand and minimize supply chain risk. 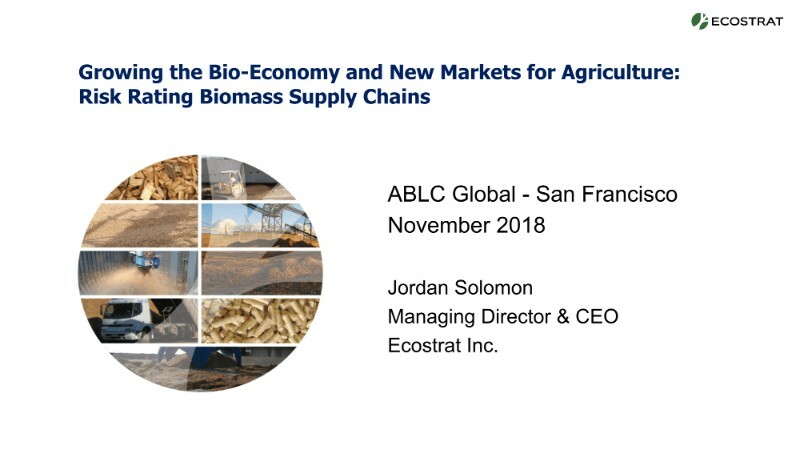 Jordan Solomon, Managing Director & CEO of Ecostrat Inc. gave this illuminating overview of growing the bio-economy and new markets for agriculture, risk rating biomass supply chains, and more at ABLC Global 2018 in San Francisco – and it’s ready for you now at The Digest online.